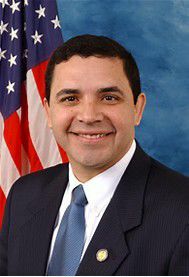 McALLEN — Amid the outcry over the separation of families at the U.S.-Mexico border under the Trump administration’s “zero-tolerance” policy, U.S. Rep. Henry Cuellar expressed support Monday for an agreement with Mexico that would force asylum-seeking migrants to first request help from Mexico. Cuellar, D-Laredo, said during a news conference Monday that U.S. officials are in talks to enter into a Safe Third County agreement with Mexico similar to one the U.S. currently holds with Canada. Such an agreement would require asylum seekers to request refugee protection in the first safe country they arrive in. What that means for asylum seekers coming to the U.S., Cuellar said, is that the number of them could decrease. “That is a big shift that we could have in our immigration,” he added. His support for such an agreement came amid remarks over the Trump administration’s zero-tolerance policy, which has gained national attention over its separation of children from their parents along the border. This week, the appropriations committee, of which Cuellar is a member, will be meeting on the $750 mil-lion he helped secure for Central American countries. The committee will also be discussing amendments to appropriations to the Department of Health and Human Services, which oversees the Office of Refugee Resettlement. The ORR takes custody of the children who have been separated from the parents as well as those that arrived unaccompanied at the border. Those amendments, Cuellar said, will be to ensure better communication with parents and their attorneys when the kids are separated and how they are treated.